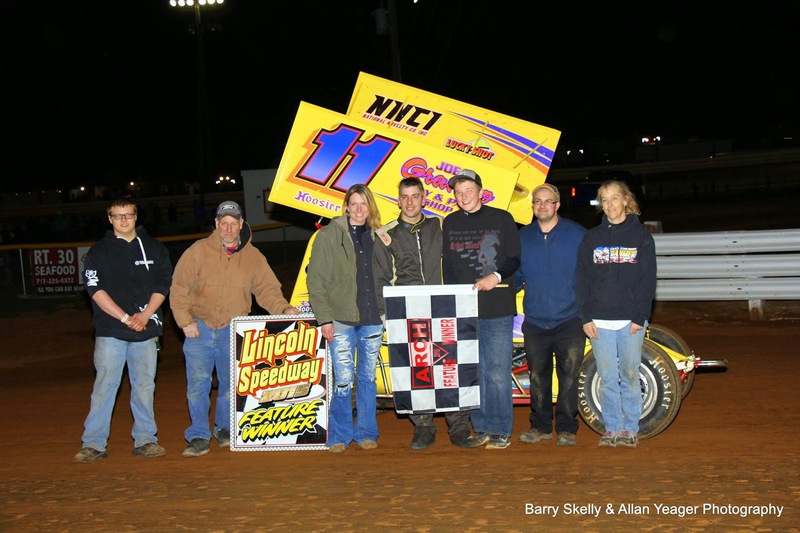 So said former track champ Lance Dewease after claiming his 38th career win at Lincoln Speedway Saturday night. Handicapping placed the C.C. Dietz/Conduit Connections/Hess Ornamental Iron Works #14 on the outside pole for the start, and Dewease followed polesitter Billy Dietrich for the first 17 laps before sliding under Dietrich for the lead in turn two of lap 18. The lone caution of the event came out when Danny Dietrich and Mike Bittinger got together on the backstretch while racing for fourth. Bittinger got backwards and came to a stop at the end of the backstretch. Although he led the rest of the way, Dewease had to hold off a charging Adam Wilt at the end, crossing just .44 seconds ahead of the Pancho’s Racing Products/North York Auto Menders #15. Freddie Rahmer caught Danny Dietrich for third on the last turn, followed by 11th starting Dietrich and 12th-starting Brian Montieth. Sixth through tenth were early-race leader Billy Dietrich, Robbie Kendall, defending champ Alan Krimes, Cory Haas, and Kyle Moody. Heats for the 30 410 Sprinters were won by Alan Krimes, Adam Wilt, and Robbie Kendall, with Glenndon Forsythe winning the consolation. 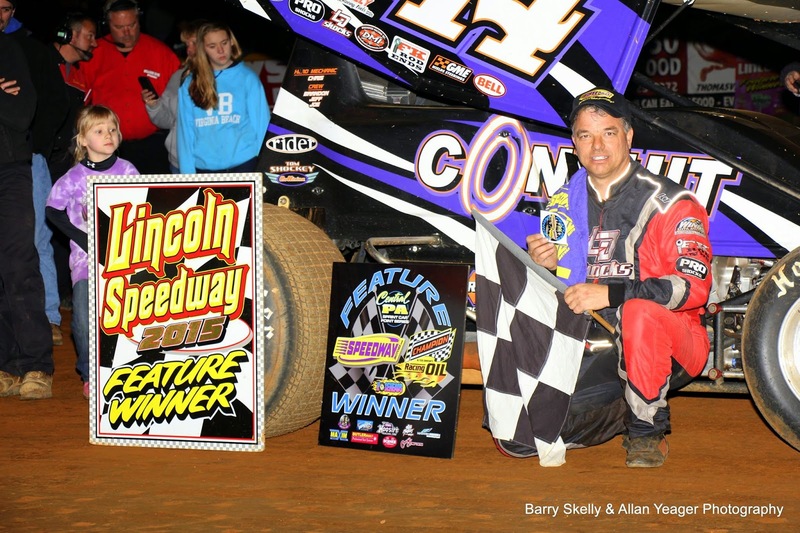 Steve Fannasy started on the outside pole and led every lap of the 25-lap super sportsman feature, becoming the first member of the Fannasy family to grace victory lane in the Pigeon Hills. Second through fifth were Scott Geesey, Chad Trout, Chad Criswell, and Steve’s brother Jay Fannasy. Polesitter Russ Mitten started on the pole and ran fourth from the second lap on until suffering mechanical problems on the backstretch of the final lap. Heats for the 27 Super Sportsman were won by Jay Fannasy, Frankie Herr, and Kevin Nouse, with Eric Walker winning the consolation. Shermansdale’s Jake Jones became the third driver in three divisions to start on the outside pole and win a feature event on the night, claiming the 20-lap Precise Racing Products Lincoln/Trail-Way season point series opener for the 358 late models. His win established a new track record for the 358 late models with a time of 5 minutes, 59.65 seconds. Crossing second .97 seconds behind was polesitter Sam Gallagher, with defending series champ and all-time Lincoln winner Gene Knaub third, Cam Zeigler fourth, and Alan Sagi fifth. Heats for the 18 358 Late Models were won by Tyler Horst and Travis Mease. Next Saturday night, April 18th, It will be JOHN H. MYERS & SONS BUILDING & REMODELING SUPPLIES NIGHT featuring the 410 Sprinters once again. The three-division show will also include the Super Sportsman and 358 late models. Race time is 7 PM, with gates opening at 5 PM and hot laps getting underway at 6:30 PM.